The Pallet Docking Frames have been designed for a Acres client. The client, a west midlands based Automotive OEM required docking frames which are used in conjunction with existing standard euro pallet dollies. The pallet docking frames have been manufactured from 80mm x 40mm rectangular hollow section. The frame work is manufactured from a thin walled rectangular section to provide an optimum strength vs weight solution. The frames also features laser cut gussets for adding strength and base plates for securing the frames to the floor. The solution also includes rubber bump stops at the far end and 20mm thick HDPE PE500 slides on the inner faces of each side to stop the dollies from getting damaged when they come in contact with the frames. 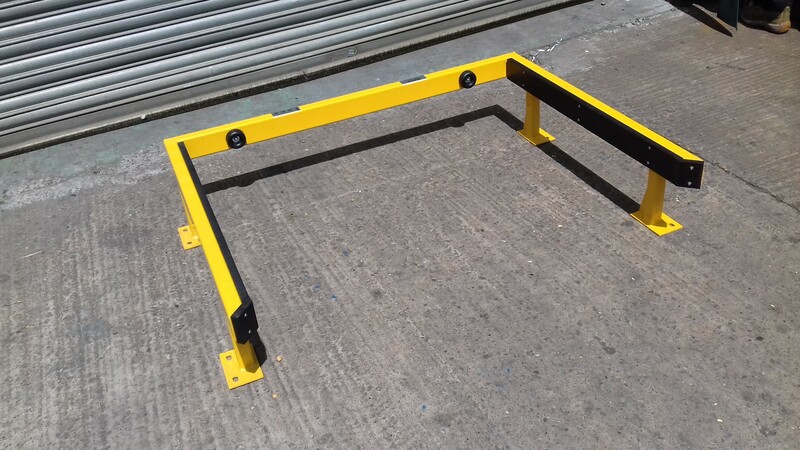 The docking frames have been powder coated in Yellow (BS 4800 08 E 51) to provide a hard wearing, long lasting finish.